This weekend’s TUDOR United SportsCar Championship round at Laguna Seca is more than just an average race for Chip Ganassi Racing’s Scott Pruett and Joey Hand, as they race in front of family and friends while also sharing a hometown connection of their own. Born 20 years apart, Pruett and Hand both hail from nearby Sacramento, a common link that helped launch their racing careers and has ultimately brought them together as teammates of the No. 01 Ford EcoBoost Riley DP. Pruett grew up around Dave McDonald, a Sacramento-area man who owned a local machine shop and helped mentor aspiring karting drivers, which later included Hand. The three got together on occasions prior to McDonald’s passing, which brought Pruett and Hand closer together. “Dave used to let me do stuff at his shop, build stuff, that’s kind of how I started to get closer to and get to know about Scott,” Hand said. “By then, Scott was already off racing professionally, but I heard stories about how he came from the same place I had. Literally, from Sacramento, and from the same backgrounds. Hand still drives by the shop every day. 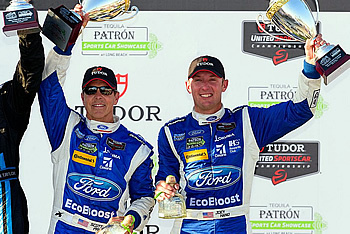 Pruett and Hand’s first race together as co-drivers ended in triumph, with victory in the 2011 Rolex 24 at Daytona. While having made select starts since then, Hand was brought on board as a full-time driver with Ganassi and Ford this year – something he always dreamed about but didn’t think possible. They celebrated their first podium together in Long Beach, where they finished p2. For Pruett, who’s accumulated countless wins with numerous co-drivers throughout his illustrious career, he’s been able to feel a special with Hand, as the two Californians complement each other as drivers. “It’s one thing to think about what your co-driver is going to bring, and it’s another to really experience it,” Pruett said. “I’m real deliberate on some things I want out of the car, and I’m not on others. What I’m not deliberate on, he is. So, I’m delivering on the holes he has, and he’s delivering on the holes I have. Hand, who has returned to full-time U.S. racing after a two-year stint in the German-based DTM series, has been impressed by Pruett’s level of commitment to success, both as a driver and as a person. “The thing I’ve already learned is his dedication to racing is really strong,” Hand said. “He’s always the first guy there in the morning. He likes to get there early in the morning, I’d rather stay late. “We can cover both ends there and it works out pretty good. “It’s just fun to be in a new program, but especially fun to have a new teammate who’s been so successful at so many things. There’s even a strong connection away from the track, which has seen the two families become even closer. “We both look at life the same way, whether it’s on the racing side or the family side,” Pruett said. “We’re not afraid to get our hands dirty. We’re not afraid to do the work. We’re not afraid to get in there and do whatever it takes. Both drivers’ enormous respect of each other has helped forge one of the strongest partnerships in the IMSA paddock, as Pruett and Hand chase the TUDOR Championship crown, as two humble guys from Sacramento. “When Scott and I sit down together, he’s 20 years older than I am, but we came from a very similar path up in racing,” Hand said. “We came from hardworking families who worked. We built our own go-karts and drove our way up to where we are. It’s just fun.